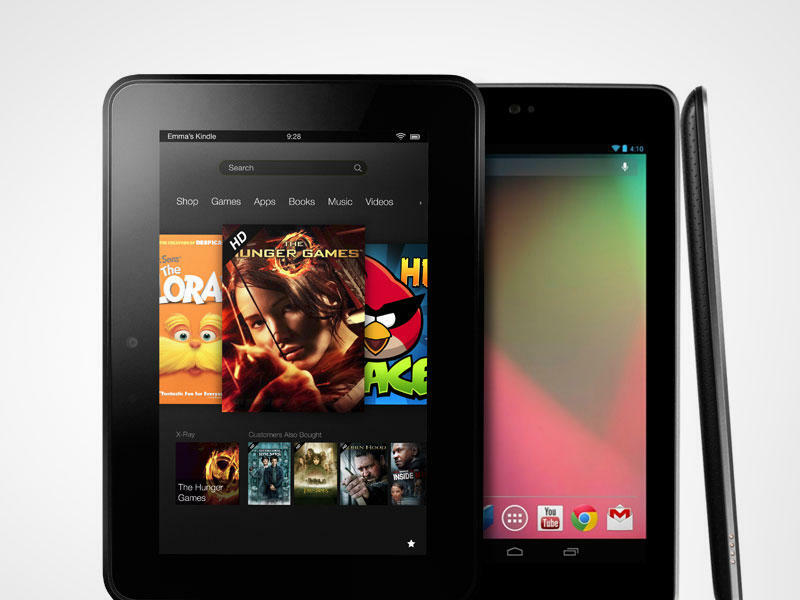 Is Amazon's Strength in Numbers Enough to Defeat Google's Nexus 7? Amazon brought a gang of Tommy Gun-equipped Fires to an Old West high-noon duel with Google's Nexus 7. It's simple, really. Rather than approaching the search giant one-for-one, Amazon pounced with three different tablets in the hopes of snuffing out Google's momentum. The Fire Gang. Not only are the new Kindle Fires equipped to compete, but priced hilariously low. It's crazy. The Nexus 7 should be quivering in its Jelly Bean boots. This is shaping up to be a huge battle. Google's tablet is the strongest 7-inch device there is. Not only does it have some wonderful technology, and access to the company's latest suite of applications, it has the company's biggest weapon at its disposal: guts are great and all, but it's the device's buttery smooth beating heart that runs the show. Seriously, Jelly Bean is the pinnacle of mobile OS's; the best there is in a wonderfully cheap tablet. Amazon can't touch that. So while Amazon's lineup is pretty amazing and up to speed with specs, they all have a pretty unfortunate heart murmur thanks to Ice Cream Sandwich. Not to say ICS is pathetic or God-awful slow; it's not. But under an insanely forked Android, you start to run into problems. It happens when manufacturers mask the vanilla flavor. There's always been a knock against Android for not quite having the same smoothness as iOS. Not so for Jelly Bean. But what about rooting? That'll likely happen from the outset. Because Amazon is offering up its lineup at such a low cost — $159 for the new Kindle Fire, $200 for the 7-inch Kindle Fire HD and $299 for the 8.9-inch — the tech hungry community will likely scoop them up with that in mind. It happened with Amazon's previous Kindle Fire. ROMs can be the answer to Amazon's ICS handicap, but that isn't the solution for the general public. Try explaining to Grandma how to install Cyanogen. You start to see some advantages when you consider the great features you get with Amazon services. The company stressed that it wants to make money when people use its devices, not when buying them. That's where stuff like Prime comes in, which is why the company introduced so many neat features that'll encourage Fire owners to spend, and spend a lot. There's X-Ray for books, movies and even textbooks. Basically, it allows users to see the "bones" of whatever content they're consuming. For movies, you can get an entire catalogue of info through IMDb with a simple tap. There's also something great called Immersion Reading, which allows folks to "fuse together printed text and professionally-narrated audiobooks." It's like group reading in school, or story time with a loved one. There's also Whispersync for Voice, for Games, Kindle FreeTime, an all-new email, and a redesigned photos experience. These features are all great for the consumer; they'll be how Amazon woos people over to its insane online consortium. It might come down to who markets their respective tablets better heading into the holiday season. People still may not know that Google even announced its Nexus 7, even though it was plastered on Google.com. Amazon on the other hand? Everyone knows Amazon offers hardware. Everyone knows what a Kindle Fire is. Amazon's website will likely be one of the top three viewed this holiday season, meaning a lot of ad impressions are getting through for its new lineup. Ohhh, new toy, at an impulse buy price. And I haven't even mentioned the fact that there will be a 32GB version with 4G LTE at just $500 with a plan that's only $50 a year. Ha, whaaat? The Nexus 7 doesn't have that. It'll be very interesting to see how this plays out among consumers. For most, Google's Nexus 7 is the clear choice because of vanilla Jelly Bean. For others — mom, dad, aunt, uncle — the trio of Fires may be a temptation that can't be ignored. The only big caveat here is the Nexus 7 has been out for a few months already; the 7-inch Fire HD doesn't ship until Sept. 14, and the 8.9-inch doesn't ship until Nov. 20, which is well on the other side of both the Surface and (probably) Apple iPad mini. Either way, it's great to be in the tablet market, and it's great to be a fan of technology.